Pacific Youth Choir is a complete graduated choral program. It features ten auditioned choirs and serves singers from kindergarten through 12th grade. Graduated members are welcome to sing in the Alumni Choir. As PYC members mature in their choral skills, they take on developmentally appropriate musical and choral challenges. 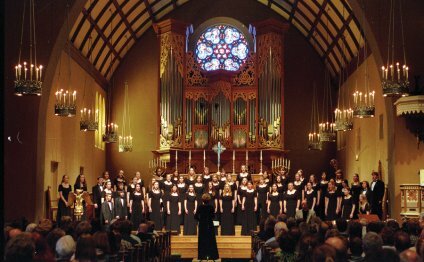 A broad range of choral literature develops their musicianship, tone, and artistry and opens singers to a life-long love of making music with others. Close to 125 voices make up our high school choir. This highly motivated and talented group sings a wide range of challenging, exceptionally high quality, 4- to 8-part choral literature. Pacific applicants must have prior singing experience and demonstrate good reading skills and vocal technique. High school-aged tenors, baritones and basses make up this choir. Tsunami men have great fun while singing beautiful choral music. The men in Tsunami are also members of Pacific Choir. Nova singers solidify the choral foundations of music reading, good tone production, and structured choir rehearsals and performances. Our youngest choir focuses on introducing a foundation for musical enjoyment and good tone production. Chamber Choir singers are dedicated, talented members of Pacific who are capable of and ready to work at an extremely intense musical level. Prospective Chamber members undergo a multi-step, extensive audition process. If asked to join the Chamber Choir, they must commit to extra rehearsals and performances. Most importantly, they are expected to be leaders and role models for all other PYC members, and ambassadors of PYC in the wider community. More than 80 high school women make up this talented treble choir, which participates in festivals and tours regionally and nationally. Pacifica singers must be able to hold their own part in 3-part treble harmony. Good music reading, vocal technique, and prior choral experience are required for entrance into this group. Pacifica women are also Pacific Choir members. Primarily made up of middle schoolers, Cascadia singers refine their vocal technique, sight reading, and strong part singing skills. Singers must be in at least 6th grade to audition for this choir. Prior singing with sight reading ability is desirable for entering Cascadia. The choir does accept talented singers with no prior choral experience. As girls and boys move into adolescence, their physical vocal development diverges widely. Separate boys and girls choirs allow us to focus with each group, helping them understand and make the most of their changing vocal abilities.